Hackney’s EartH is hosting a new music series EartH Sessions in the bar area of EartH Kitchen. 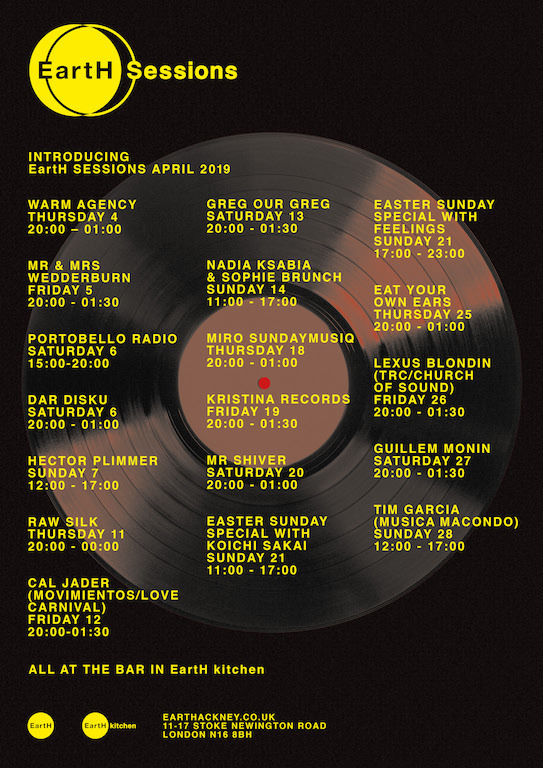 Kitted out with a Tannoy soundsystem, shows from Eat Your Own Ears, Warm Agency, Kristina Records, Nadia Ksabia and Sophie Lloyd are lined up in April. EartH Sessions has been put together especially for the space for late night jazz sessions; party sets of disco, funk, hip hop and leftfield; Sunday brunches with rare groove and downtempo. The series sits alongside events in the theatre and concert hall such as sold out shows for Nilufer Yanya, Lambchop, Richard Hawley, Aldous Harding, Teleman, Ross From Friends and Jordan Rakei. EartH Kitchen is geared towards being a destination for gig-goers to meet for an aperitif; a pre-show dinner; or after-gig nightcap at the end of the evening. For the rest of April, event-goers to the EartH main spaces can take advantage of 25% off at EartH Kitchen and priority access by showing their event ticket for the same date on arrival at the restaurant. For more EartH Sessions updates, head to their Facebook event pages.